Jaguar Mining Increases Reserves 81%; Large Growing Base of Higher Grade Reserves, Near Surface at Turmalina, To Drive Gold Production Growth and Extend Mine Life | Jaguar Mining Inc.
Toronto, Canada, March 1, 2019 – Jaguar Mining Inc. ("Jaguar" or the "Company") (TSX: JAG) is pleased to report Mineral Resources and Mineral Reserves estimates as at December 31, 2018 for its Pilar Gold Mine ("Pilar") and Turmalina Gold Mine ("Turmalina"), each prepared in accordance with CIM definitions (2014) as required by National Instrument 43-101 ("NI 43-101"). Mineral Resources and Mineral Reserves updates are supported by NI 43-101 Technical reports that twill be filed on SEDAR within 45 days. Ben Guenther, Interim CEO of Jaguar Mining stated: "We achieved solid growth in our 2018 year-end Proven and Probable gold ounces that increased by 81% to a large base of 439,000 ounces compared to 2017, in addition to depletion. We are especially pleased that results have delivered a meaningful increase in both Proven and Probable tonnes and grade at Turmalina. Turmalina Orebody A and Orebody C both have significant life at favorable grades of 5.47 and 4.73 g/t respectively. Both Turmalina and Pilar have over 4 years of Proven and Probable Reserves at current mining rates and over 3 years at our target production rates. The 2018 focus was on Resource-Reserve Conversion via infill drilling at both operations after significantly increasing our Resource Inventory in 2016-2017 through the growth exploration program." "Looking forward, the increase in Mineral Reserves greatly improves our confidence in the production capability to support a return to a growing gold production profile and the potential to extend the mine life at Turmalina and Pilar." Jaguar Mining prepared the Mineral Resource and Reserve estimates under the supervision of Reno Pressacco, P.Geo, and Jeff Sepp, P.Eng. of Roscoe Postle Associates Inc. ("RPA"). RPA is an independent mining consultant and Mr. Pressacco and Mr. Sepp are Qualified Persons within the definition of NI 43-101. The effective date of the estimates is December 31, 2018. An independent technical report documenting the Mineral Resource and Mineral Reserves estimates for the Pilar mine, prepared in accordance with NI 43-101, will be filed on SEDAR within 45 days of the date of this press release. 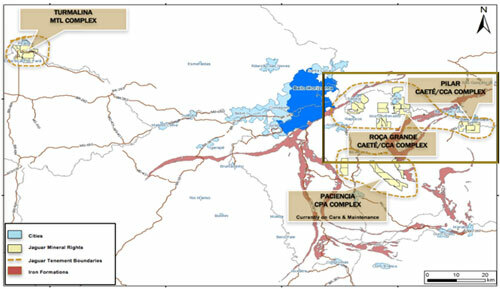 Pilar is an underground gold mine and is part of the Caeté Gold Complex that also includes the underground Roça Grande gold mine (currently on care and maintenance) and mill operation. The Caeté Complex is located in the municipalities of Caeté and Santa Bárbara, respectively, in the state of Minas Gerais, Brazil, and is approximately 100 km from Belo Horizonte, the capital city of the state of Minas Gerais. Turmalina is an underground gold mine and plant complex, also located in the state of Minas Gerais; approximately 130 km northwest of Belo Horizonte (see Figure 1). There are no known environmental, permitting, legal, title, socio-economic, political or other risk factors which could materially affect the Mineral Reserve estimates. There are no known environmental, permitting, legal, title, socio-economic, political or other risk factors which could materially affect the Mineral Resource estimates. Infill Drilling and evaluation of remnant material completed in 2018 successfully replaced depletion. Mineral Reserves are now equivalent to more than three years of production at current and planned production rates resulting in total 2P Mineral Reserves of 211,000 ounces of gold (1,784,000 tonnes at an average grade of 3.68 g/t Au) which are 69% higher compared to 2P Reserves of 125,000 ounces as at December 31, 2017. Mineral Reserves at Pilar are based on the main orebodies currently in production centered on Levels 9, 10 and 11 (BA, BF and BFII). Further work is in progress to convert the M&I Resource inventory to 2P Reserves on material from other orebodies and remnant material that are accessible from ramp and access development throughout the mine. The database, used to prepare the estimates, with a cut-off date of December 31, 2018, comprises 1,658 drill holes and 20,698 channel samples. The estimate was generated from a block model constrained by three-dimensional (3D) wireframe models. A capping value varying from 10 to 60 g/t Au was applied for all eight orebodies. Wireframe models of the mineralization and excavated material for Pilar were constructed by Jaguar and reviewed by RPA. A separate wireframe was prepared for each orebody and was used to constrain the grade estimates into the block model. Mineralized material for each orebody was classified into the Measured, Indicated, or Inferred Mineral Resource categories based on the search ellipse ranges obtained from the variography study, the observed continuity of the mineralization, the drill hole and channel sample density, and previous production experience from these orebodies. For the December 31, 2018, estimates, the Company prepared an updated geological and block model under the supervision of RPA. The Mineral Resources and Mineral Reserves for 2018 will be supported by a NI 43-101 technical report to be filed on SEDAR within 45 days of this press release. Infill Drilling and evaluation of remnant material completed in 2018 successfully replaced depletion. Mineral Reserves are now equivalent to more than three years of production at current and planned production rates resulting in total 2P Mineral Reserves of 228,000 ounces of gold (1,408,000 tonnes at an average grade of 5,05 g/t Au) which are 95% higher compared to 2P Reserves of 117,000 ounces as at December 31, 2017. Orebody C grade and tonnage increases underpinned an 81% increase in shallow – high grade Mineral Reserves to 123,000 oz´s.at 4.73 g/t Au which now surpasses the total Orebody A 2P Mineral Reserve of 105,000 oz´s. (refer to Table 8). Mineral Resource estimates at December 31, 2018, reflect an updated geological and block model prepared by Jaguar staff under the supervision of RPA. This updated block model incorporates the results from the on-going diamond drilling campaigns completed since late 2017. This Mineral Resource includes total Measured and Indicated Resources of 577,000 ounces of gold (3,253 million tonnes at an average grade of 5.52 g/t Au) and Inferred Resources of 148,000 ounces of gold (1,066 million tonnes at an average grade of 4.31 g/t Au). Orebody C Mineral Resource grades have increased following new infill drilling intercepts and from development channel sampling completed in 2018, in particular on Levels 3 and 4. (Please refer to Press Release 27th February 2019). Increases in Measured and Indicated Resources (and concomitant decrease in Inferred Resources) compared to the previously reported resource inventory is in line with the Company's target of replacing reserves mined in 2018 and establishing a significant increase in M&I Mineral Resources mainly below Level 11 on Orebody A and Level 4 on Orebody C (refer to Figures 6, 7, 8 and 9). The database used to prepare the estimates, with a cut-off date of December 31st 2018, comprises 3,980 drill holes and 16,246 channel samples. The estimate was generated from a block model constrained by three-dimensional (3D) wireframe models. A capping value of 50 g/t Au was applied for all three orebodies. The wireframe models of the mineralization and excavated material for Turmalina were constructed by Jaguar and reviewed by RPA. A separate wireframe was built for each orebody and was used to constrain the grade estimates into the block model. The mineralized material for each orebody was classified into the Measured, Indicated, or Inferred Mineral Resource categories based on the search ellipse ranges obtained from the variography study, the observed continuity of the mineralization, the drill hole and channel sample density, and previous production experience from these orebodies. The scientific and technical information contained in this press release has been reviewed and approved (i) in respect of the estimated Mineral Reserves and the Life of Mine Plan (LOM) by Jeff Sepp, P.Eng., of Roscoe Postle Associates Inc. ("RPA"), and (ii) in respect of the estimated Mineral Resources by Reno Pressacco, P.Geo., of RPA. RPA is an independent mining consultant and Mr. Sepp and Mr. Pressacco are each Qualified Persons within the definition of NI 43-101. Half of the sawed sample is forwarded to the analytical laboratory for analysis while the remaining half of the core is stored in a secure location. The drill core and rock chip samples for resource-reserve conversion and grade control samples are transported for physical preparation and analysis in securely sealed bags to the Jaguar in-house laboratory located at the company´s Caeté Complex, Caeté, Minas Gerais. Growth exploration samples are sent to the independent ALS Brazil (subsidiary of ALS Global) laboratory located in Vespasiano, Minas Gerais, Brazil. The analysis of these exploration samples is conducted at ALS Global's respective facilities (fire assay is conducted by ALS Global in Lima, Peru, and multi-elementary analysis is conducted by ALS Global in Vancouver, Canada). ALS has accreditation in a global management system that meets all requirements of international standards ISO/IEC 17025:2005 and ISO 9001:2015. All major ALS geochemistry analytical laboratories are accredited to ISO/IEC 17025:2005 for specific analytical procedures. For a complete description of Jaguar's sample preparation, analytical methods and QA/QC procedures, please refer to "Technical Report on the Roça Grande and Pilar Operations, Minas Gerais State, Brazil", a copy of which is available on the Company's SEDAR profile at www.sedar.com. The distribution of Mineral Resources at Turmalina Gold Mine as at December 31, 2018, (left) and December 31, 2017, (right) seen from the hanging wall looking towards the south west.